FILE - From left, Brothers of Italy's Giorgia Meloni, Forza Italia's Silvio Berlusconi, and the League's Matteo Salvini attend a media event for center-right leaders ahead of the March 4 general elections, in Rome, Italy, March 1, 2018. U.S. officials are scrambling to assess how this past Sunday’s Italian election results may impact future relations between Rome and Washington. The prospects of euro-skeptic populist parties that have strong ideological ties with the Kremlin forming Italy’s next government or dominating a broader governing arrangement has prompted alarm in the U.S. capital and Brussels. 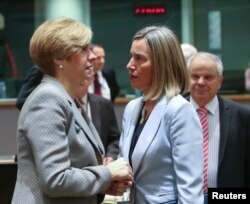 Italy's Defense Minister Roberta Pinotti (L) talks with European Union foreign policy chief Federica Mogherini during a European Union foreign and defense ministers meeting in Brussels, March 6, 2018. An immediate consequence of either the right-wing Lega or anti-establishment Movimento 5 Stelle (M5S) entering a coalition government could be the “curtailment of a lot of intelligence we currently share,” say U.S. officials. “There would a sharp downgrading of what we give the Italians, although this wouldn’t affect our exchanges when it comes to jihadists or terrorist threats,” a U.S. counterintelligence official told VOA on condition of anonymity. U.S. security agencies are already starting to assess what intelligence could be supplied, given the higher risks of leaks to Moscow, says the official. “Security risks would increase obviously,” he added. Who’s appointed to head Italy’s foreign and security ministries as well as security agencies could define the tightness of any restrictions, he said. 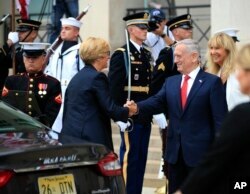 FILE - Defense Secretary Jim Mattis greets Italy's Defense Minister Roberta Pinotti, during an honor cordon at the Pentagon, July 11, 2017. Roberto Jonghi Lavarini of Fratelli d’Italia (Brothers of Italy), a far-right sister party of the Lega, which is part of the right-wing coalition that includes Berlusconi’s own Forza Italia, told Russia’s Sputnik TV his party is already angling to secure either the interior or defense minister positions in addition to several deputy ministerial posts in any right-wing coalition government that is formed. He said such a government would work on lifting the Western sanctions imposed on Russia after the Kremlin annexed Crimea from Ukraine in 2014 and pursue “a privileged dialogue with Moscow." His party would push, he said, for a revision of all international treaties, including those governing Italy's membership of the eurozone and NATO, in favor of a strategic tie-up with Russia. 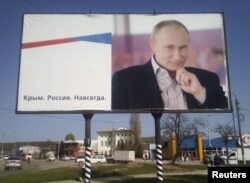 In the same year, a delegation of politicians from the Lega and Fratelli d’Italia, alongside half-a-dozen Italian business people who had been impacted by the sanctions, visited Crimea. Relations between U.S. and Italian intelligence agencies are not as close as they are with some other Western and NATO countries. 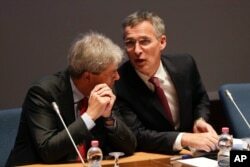 FILE - Italian Foreign Minister Paolo Gentiloni, left, and NATO Secretary General Jens Stoltenberg during "Nato cooperation with Partners in the Mediterranean and Middle East" meeting at the NATO Defense College headquarters, in Rome, Oct. 14, 2016. Intelligence relations between the United States and Italy were impaired in 2009 when an Italian court convicted in absentia a former CIA station chief and 22 other Americans, almost all agency operatives, for their involvement in the kidnapping of a Muslim cleric from the streets of Milan in 2003 and his rendition to Egypt. FILE - Russian President Vladimir Putin, right, and former Italian Prime Minister Silvio Berlusconi visit the Khan's Palace in the town of Bakhchisarai, Crimea, Saturday, Sept. 12, 2015. Speaking Monday in Moscow, Leonid Slutsky, chairman of the foreign affairs panel in Russia's lower house of parliament, or State Duma, said given the election’s outcome, he had “no doubt” Russian-Italian relations would improve. In 2014, in the wake of revelations that France’s National Front had received Russian loans, Matteo Salvini, Lega’s leader, denied his party had ever received funding from Moscow.